If you are unfamiliar, Eeyore is a character in the Winnie-the-Pooh books by A. A. Milne. He is well known for his gloomy, depressed personality. 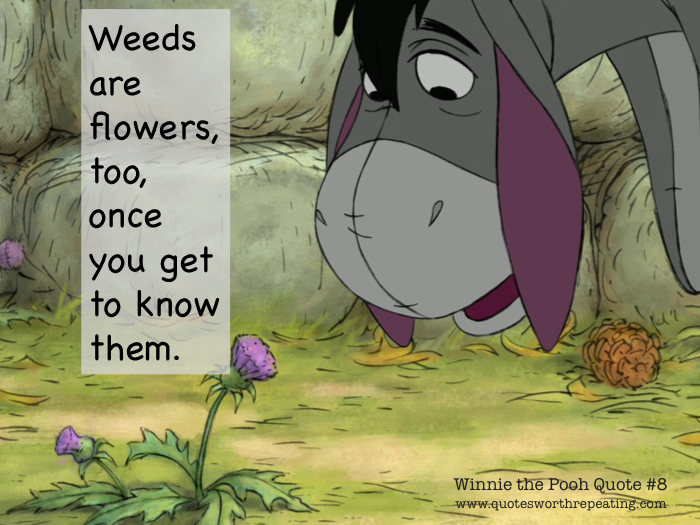 Truthfully speaking, as I’ve gotten older, I’ve realized why Eeyore was my favorite character out of all the others. I could relate. No matter what was going on, he was sad. The difference between Eeyore and I was that I felt the need to mask my sadness, even as a child. I remember being told a few times throughout my life that “no one wanted to be around someone who was sad all of the time.” This forced me to put on such “mask” because I didn’t want to be shunned by society. Honestly, I love people. I love the energy that people provide, I love their smiles, I love helping them when they are in need, I love humanity as a whole. So, I did what I had to do to be a part of society. I hid. Hiding created anxiety because I didn’t want to be discovered. I didn’t want anyone; family, friends, co-workers, God…to see my sadness. I needed everyone to know I was ok, like everyone else. But let me tell you, once you suppress something long enough, it would eventually bubble to the surface. Trust me. Recently, I’ve been faced with social anxiety. My sadness has reared it’s ugly head and I can no longer contain it with my own strength (if you guys haven’t been able to notice), thus causing extreme anxiety. Sadness is not something I can’t control, nor is it something that I voluntarily chose to have (like some would like to think). This is why it is called a “mental illness”. My church started offering a social event called, Parents Connect. It’s a night where parents come together once a month, without their children, and socialize. I tried to attend the first event. I drove the twelve minutes to get there, grabbed my purse, stepped out of my car, checked the rearview mirror to see if I had anything on my face, walked to the door, and looked through the window like a creep. I suddenly felt the need to turn around and run (which I did, well more of a fast paced walked). My palms became sweaty, I began to shake and tremble. It was horrible. It was the beginning of a full-blown anxiety attack. I saw all of those parents who were well dressed, smiling, laughing, enjoying themselves. Honestly, I just felt like I wouldn’t fit in. So, I ran. Sat in my car for the next hour reading a book…in the church parking lot because I was too ashamed to come home and tell my husband that I couldn’t handle it. How did Eeyore do it? How was he so sad all of the time, yet was able to have fun with Tigger and the rest of his friends during social events? If you are unfamiliar with Tigger, he is also a character in Winnie-the-Pooh. His personality was very exuberant, friendly, and energetic. The complete opposite of Eeyore. I believe the reason why Eeyore was able to be sad but still have friends was that he didn’t put on a mask. He didn’t have to suppress his sadness because that’s just who he was. He accepted it and his friends did too. Which brings me to my next point, anxiety just isn’t anxiety. Anxiety is the result of a deeper, rooted issue. For me, my rooted issue is fear. Fear of being discovered. Fear of judgement. Fear of rejection. When I saw the other parents living it up like it was 1999, I was afraid. I was afraid that I would walk in like Eeyore at a Tigger party, except they would judge me or treat me like a leaper because “no one likes to be around a person who is sad all of the time.” So I ran and spent time with the only person I knew wouldn’t judge me; Jesus. If you thought I was going to say myself, that would have been a whole lie because I judge myself all of the time. I’ve been feeling really anxious lately, but then God revealed to me it is due to fear. Once I thought about it, I couldn’t help but agree. I am truly afraid. I’m afraid all of the time. I’m afraid for my children’s future. I’m afraid of what people may say about my appearance or health. I’m afraid of certain family members and their judgement. I’m afraid of the choices I’ve made and the result of them. I’m afraid that I may never get better. Any of this sound familiar? If not, it wouldn’t surprise me that I’m the only crazy worrying about this kind of nonsense because let’s be honest, who cares what people think? Or better yet, why do I care? Because I’ve always cared. It’s been a driving factor in my life to do well and be in the “elite class” of humanity. And when I fall short, I am judged, thus creating fear. I wish I wasn’t like this. I pray every day for the Lord to take it away, but then if I don’t have it, will I still have the passion that I have for humanity as a whole? Ok, I think I’m going down a rabbit hole with this one. Louie Giglio, a pastor at Passion City Church, wrote, “The antidote to fear is faith, and the soundtrack of faith is worship.” When we are feeling fearful or anxious, this is the time to draw closer to God. We must remind ourselves that he is able by refocusing on him and his plan for our lives. Did you know that in the Bible, God tells us to “fear not” 366 times? That’s every day of the year including leap year. Fear and anxiety is not something we are supposed to carry. I know his plans for me aren’t to walk around in fear, that’s what Satan wants. He is not of God of fear, but a God of mercy and righteousness. His gift of grace does not include fear, anxiety, depression, addiction, anger, hopelessness, rejection, nor judgment. Those are the enemies tricks and lies. But now God has shown us a way to be made right with him without keeping the requirements of the law, as was promised in the writings of Moses[a] and the prophets long ago. 22 We are made right with God by placing our faith in Jesus Christ. And this is true for everyone who believes, no matter who we are. Next time you feel anxious about anything, I recommend you to do two things: (1.) Find the root of the anxiety so whatever fruit you bear will be free of it (2.) Draw nearer to Jesus because he bore that fear and punishment for you on the cross. Give it to God! Remember, as I stated Prayer Is The Best Medicine. Pray for yourself, pray for others, pray for those in need, which is everyone! We all need Jesus. I love you all and have a wonderful day. Dear girl, it’s been a while since I’ve seen you here and it’s good to see you! My posting has been sporadic lately, so I may have just missed you. I’ve been where you are. Until I got on to the right medication, that is. Have you talked to your doctor about this? That’s where I would start if I were you. Sadness and anxiety are part of depression. Prayer works, I know. But it doesn’t hurt to try other things. I love that Eeyore had faithful friends because they loved him and accepted him for who he was! Also, you can be sure that you’re not the only one who struggles with fear. It’s all around us; it permeates our society and our media. Even the Psalmist experienced fear. He said, “What time I am afraid, I will trust in thee.” It’s not IF I become afraid, but WHEN I become afraid. Fear is a part of life. It’s what we do with it that is important. It might be said that if I put my trust in Him every time I am faced with fear, and if that happens every day, I am exercising my faith muscles, and they will, over time, become stronger and stronger. I love your 2 things to do list! And yes, worshiping God in the face of fear is the best! This was a message I needed! You are brave for baring your soul to the world. Thank you for being courageous. I can completely relate and Thank You for sharing.